Since that's a lot of stuff, I've divided it into two prize packs! That means there will be two winners! 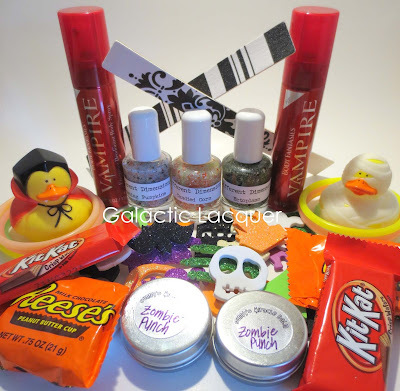 First Prize: contains two polishes from Different Dimension that glow in the dark - Ectoplasm and Candied Corn. 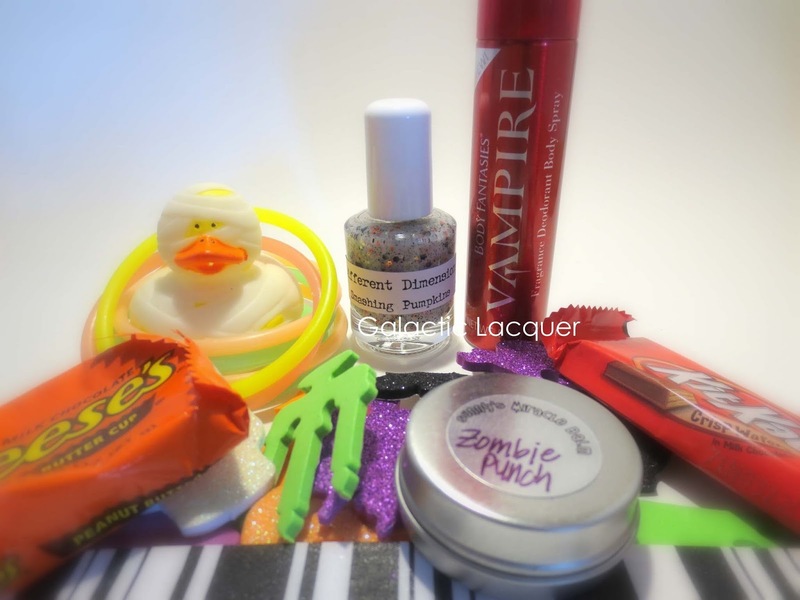 It also contains one Sunny's Miracle Balm from 365 Days of Color in Zombie Punch scent. Other goodies include Vampire body spray, a vampire rubber ducky, glow in the dark bracelets, a nail file, candy, and Halloween foam stickers! 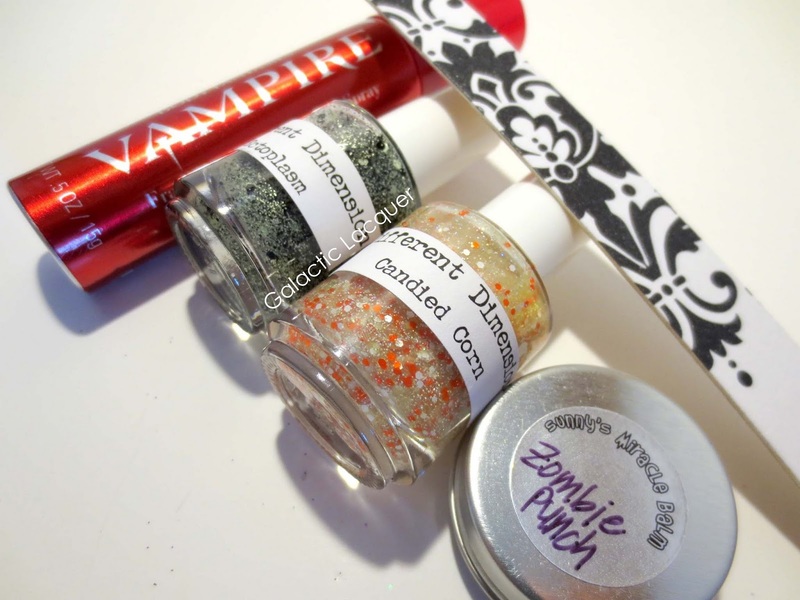 Second prize: The second prize includes one polish from Different Dimension in Smashing Pumpkins. This one also glows in the dark! 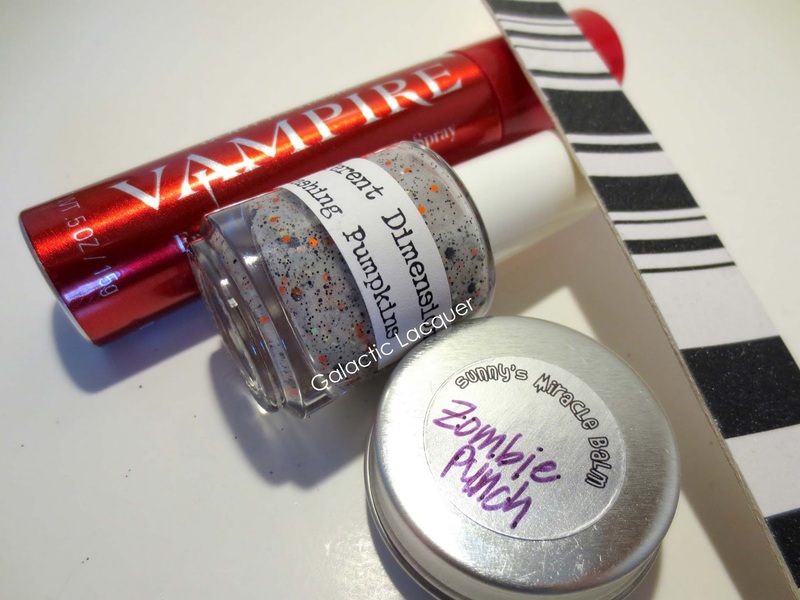 It also contains one Sunny's Miracle Balm from 365 Days of Color in Zombie Punch scent. 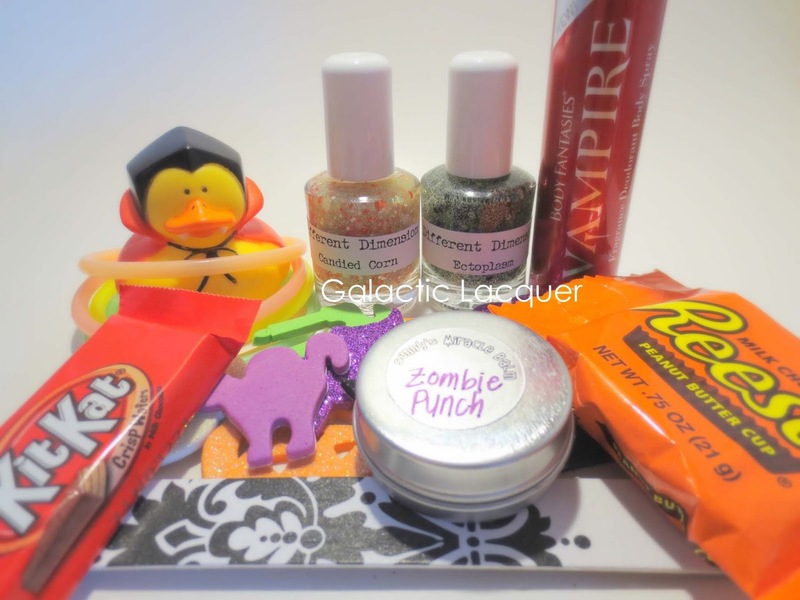 Other goodies include Vampire body spray, a vampire rubber ducky, glow in the dark bracelets, a nail file, candy, and Halloween foam stickers! Entrants must be a resident of the US (including PR) or Canada - sorry, this giveaway is not international! As usual, all prizes are purchased with my own money. This is not a sponsored giveaway. If the prizes break in shipping or are lost, I am not obligated to replace them, sorry. I will pack them very carefully! This giveaway is not sponsored, endorsed, or related to Facebook in any way. It is a private blog giveaway for fun! With that out of the way, continue on to the Rafflecopter below to enter! This giveaway will run for two weeks and ends on October 13th to help ensure that the prizes can make it to the two winners in time for Halloween! Winners will be chosen randomly via the Rafflecopter widget and emailed is they win! 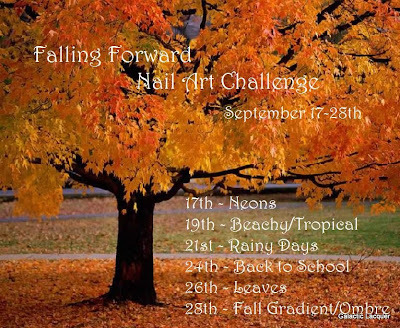 Last day of the Falling Forward Nail Art Challenge! Today's theme is fall gradient/ombre. I decided to take more of a gradient route and didn't want to do a full-on ombre across all of my nails. 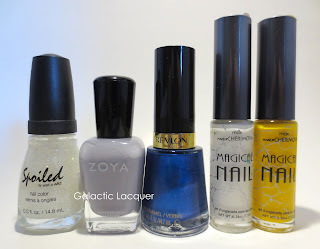 Instead, I opted to do a glitter gradient with some new glitter polishes from Shimmer Polish! I only used a few colors for this gradient, but I love it! I purposely picked a subtle brown base (Sinful Colors Nirvana) and then applied the bright glitters on top. They're super shiny and sparkly, and I love how the gold and the red work together! It definitely reminds me of fall leaves now. I used two coats of Sinful Colors Nirvana for my base. Then I applied Shimmer Polish Carmen about two-thirds of the way up my nail. 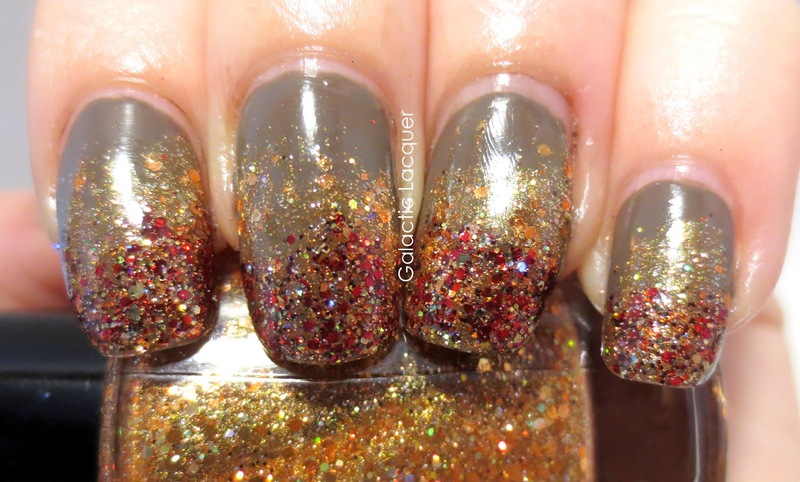 Carmen is a beautiful gold glitter polish with lots of shimmer, hence the name "Shimmer" Polish, I suppose! 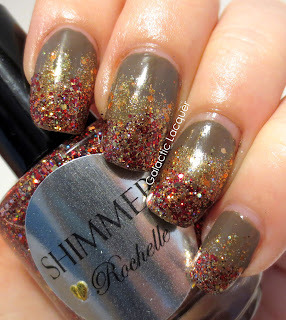 I then applied Shimmer Polish Rochelle on the lower third of my nails. The reddish-maroon glitter is perfect for fall, and it fades in great with the bits of gold it has too. 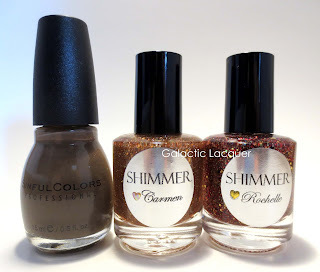 This is my first experience with Shimmer Polish, but I will definitely be posting about more after this! 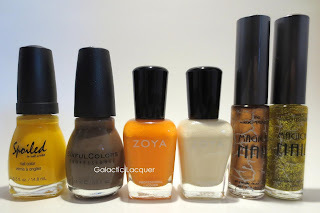 I love these polishes so far, and I love how they made this manicure turn out! I'm completely stoked for fall time now, and even though it's still hot in Florida, this makes me want to bring out the Halloween and fall decorations. I'm going to go enjoy my awesome fall nails for the weekend now! 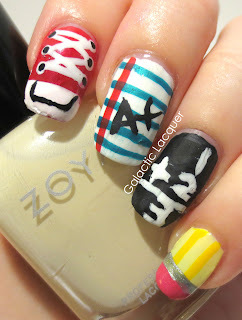 I'll also be sporting these bad boys at another blogger meetup tomorrow! Don't forget to see check out how these other ladies wrapped up the Falling Forward Challenge! 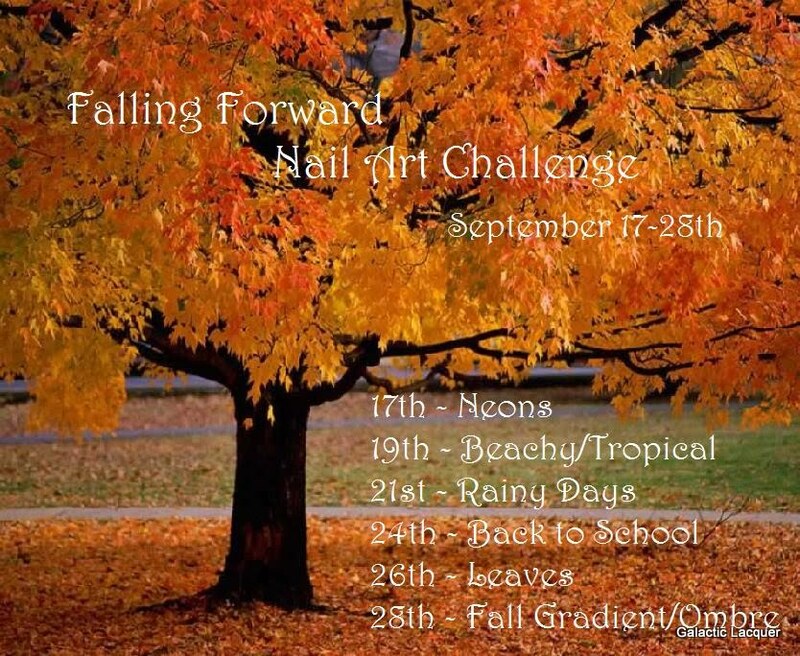 Almost done with the Falling Forward Nail Art Challenge! This has gotten me pretty excited for the fall season, and it definitely helped that Florida got somewhat of a cool front too. Now I'm ready for open window weather, pumpkin flavored everything, and especially Halloween! We don't get too many trees that change color down here, but I tried to do some nail art inspired by fallen leaves. I know, I know. They don't look too terribly like leaves. I suppose my excuse is that I never get to see piles of autumn leaves in Florida! I've never even been out of state in fall or winter either. 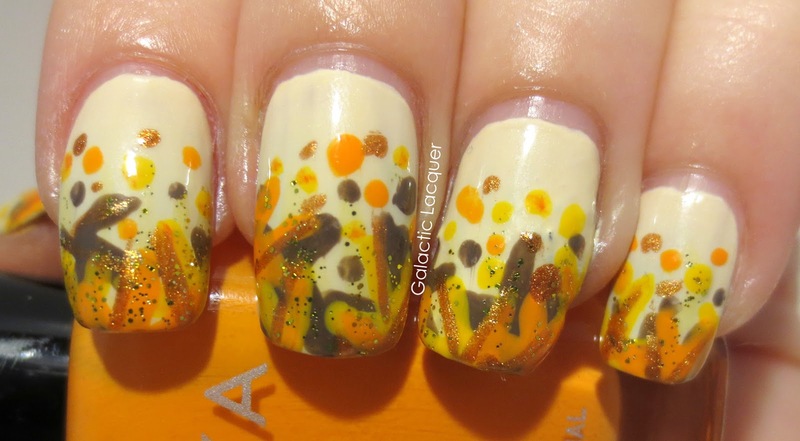 I was going to just put one big leaf on each nail in a different color, but I decided to try the leaf pile. I think they turned out alright. I used a very fine brush with my "normal" polishes instead of my nail art polishes, though I used a couple nail art polishes to add a little sparkle. I made them shaped like 3 or 5-pointed leaves and added some dots to also make it sort of like a gradient. 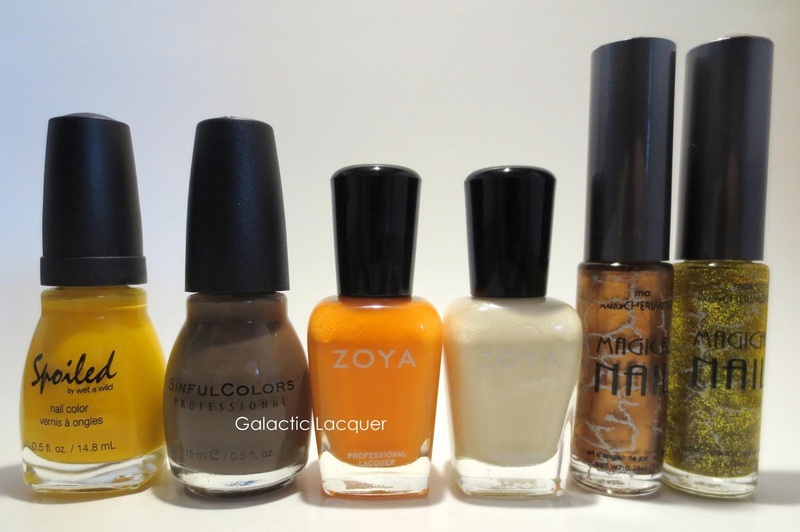 I started off with two coats of Jacqueline as my base, and then started adding leafy shapes toward the tip of the nails in Designated Driver, Nirvana, and Sharon. I then just added a bit of Copper and Gold Glitz here and there for a little sparkle and shine! They may not look too much like leaves, but it does remind me of autumn, and the colors make me think of Thanksgiving especially. Since I did somewhat of a pseudo-gradient here, I guess I'm almost ready for the final challenge: Friday's gradient/ombre challenge! Don't forget to see how these other blogs took on the Leaf challenge! 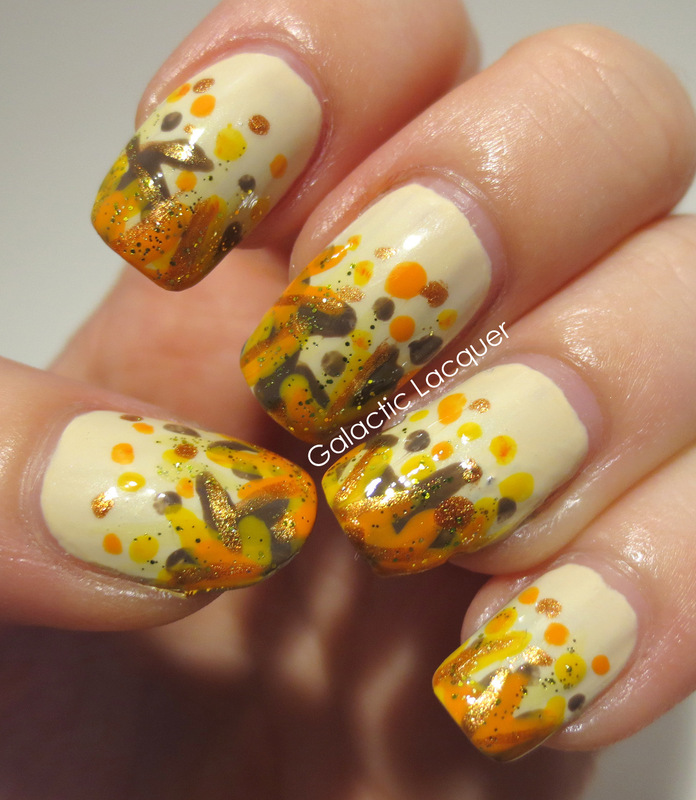 On to the second and last week of the Falling Forward Nail Art Challenge! I like how this challenge isn't daily so I can continue to participate between work, class, and life in general. But it's often enough to still be fun and for me to get my nail art fix. 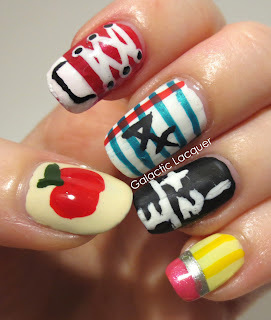 For today, back to school nails! I had a lot of fun doing these nails. I just kept pulling out polishes and colors to make different designs, and by the time I was done, I had about 14 polishes on my desk! I decided to try some different ideas such as school supplies, new shoes, and a blackboard. I like how they all turned out! On my pointer I chose to do a red shoe. I suppose it looks like a red Converse shoe in particular, but back to school time meant new shoes for a new year throughout grade school. It was the only time I got a new pair, so it was always exciting to me. For the other nails, I did a piece of notebook paper, a blackboard, a pencil (eraser end), and an apple. I applied a matte topcoat to the notebook paper and blackboard nails to make them not as glossy, but put Seche Vite on the apple, shoe, and pencil. I used a lot of colors for this, but that just makes it more interesting! 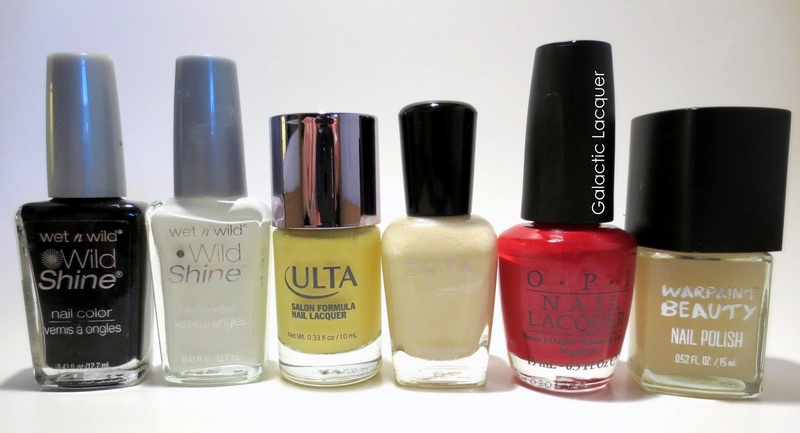 From left to right: Wet n Wild Black Creme, Wet n Wild French White, Ulta Cream of the Crop, Zoya Jacqueline, OPI Red, Warpaint Beauty Matte. So many polishes, and so many details this time! But so worth it. I enjoyed painting these, and I think they're really cute. See what these other participating ladies did for their Back to School nails! Day two of the Falling Forward Nail Art Challenge! This challenge is only Monday, Wednesday, and Friday, so it's a little easier to manage than a daily nail art challenge. 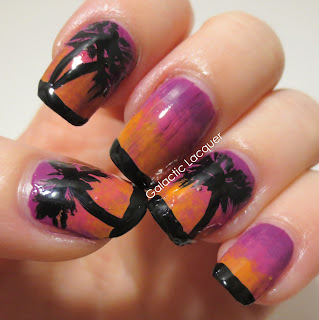 For today's transition from summer to fall, we have beachy and tropical nails! So after yesterday's fiasco with moving the couch and changing the car battery in the dark, I noticed a couple of my nails starting to tear. Luckily only one is on my "photo hand," so I tried to fix it using the tea bag method for the first time. It's a little lumpy, even after trying to buff it out a little, but it'll do! I probably also should have used my usual thick coat of Seche Vite on top, but I've recently been trying out Out the Door instead, which isn't as thick to me. After fixing my nail, I painted these bad boys! I'm pretty proud of this nail art since I haven't done anything like this yet. 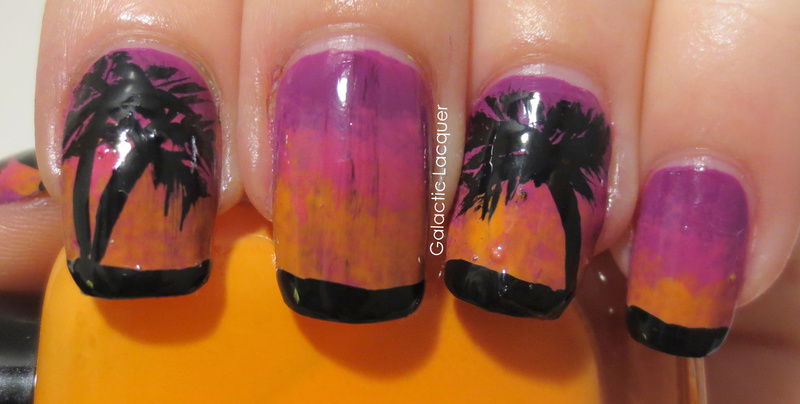 I thought I would go with the tropical paradise sort of theme and paint a beach sunset. I first did a sponge gradient, and then free-handed the ground and some palm tree silhouettes on top. 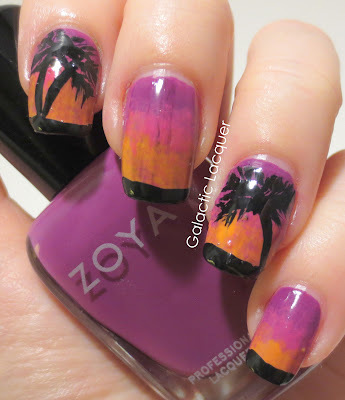 To keep with the beachy theme, I grabbed some of my summer Zoyas to do the gradient. I know Kieko isn't part of the summer lineup, but I needed something a little more purple than Reagan. At least Lara and Arizona are from that collection! I really like how the gradient turned out. It doesn't blend perfectly since I haven't done a sponge gradient since the 31 Day Challenge, but I think it's pretty! The black sand silhouette also is a little wavy since I didn't tape it off, but I guess that makes sense if it's supposed to be sand! All in all, another success! 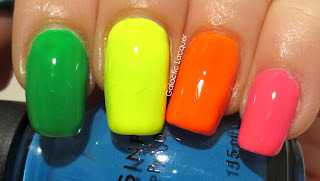 I figured I should go all out today since my Neon nails were a little boring on Monday. Now I look forward to the next challenge! 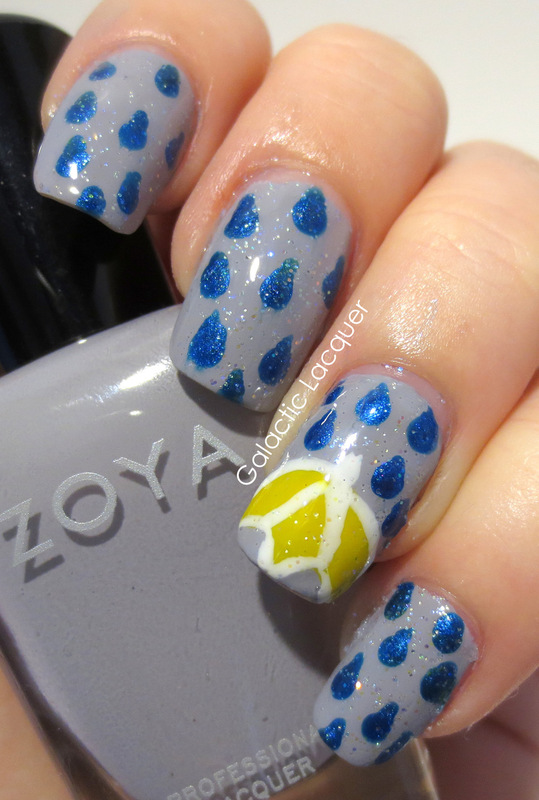 Today marks the first day of a new mini nail art challenge! 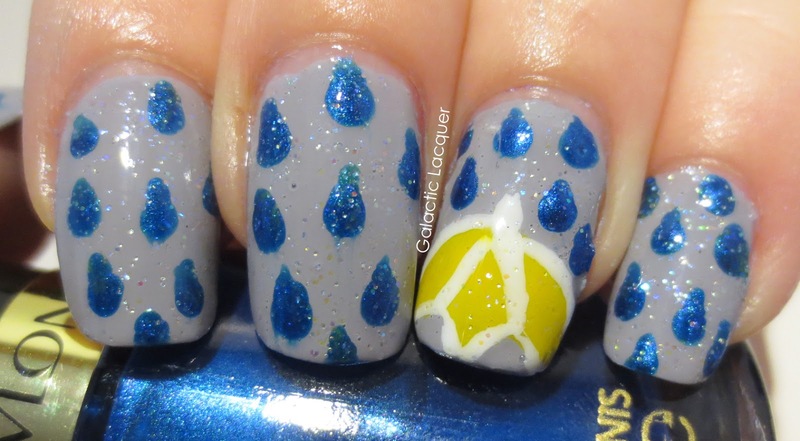 I haven't done a nail art challenge in a while, so I thought this one would be fun. Several other bloggers are participating, so you might see some others doing it as well! For the first day, we have neons. 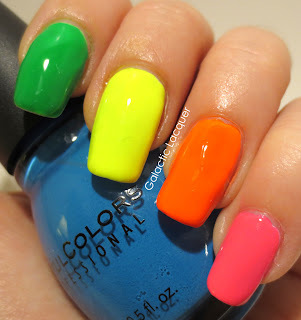 Neons are the perfect summer color, and I totally wanted to use my neons at least once more before turning toward the darker fall colors. 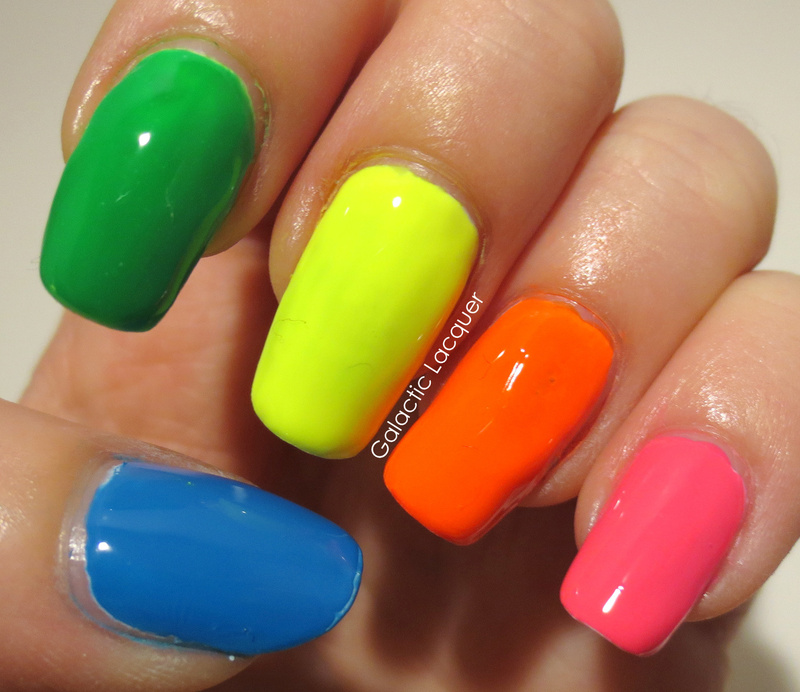 I had so many ideas for fun colors like neons, but unfortunately neon polishes tend to be pretty thin and streaky! I didn't do anything too entirely spectacular due to lack of time today. I had to pick up a couch, which actually turned into me strapping a couch to the roof of my car, and then the car not starting again! So after replacing the battery, bringing the couch upstairs, and doing my nails, I'm pretty beat! Like I had mentioned before, I wanted to do something a little more "fun." I was going to add funky French tips to each nail in a different neon color, but my neons were so streaky and thin that adding them would be a nightmare! 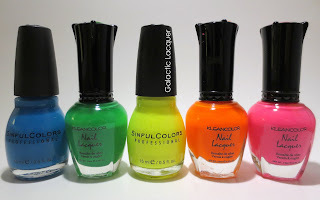 I first tried Sinful Colors Irish Green and Sinful Colors Summer Peach (the green and orange), but found that KleanColor Neon Green and KleanColor Neon Orange covered a bit better without being as streaky. 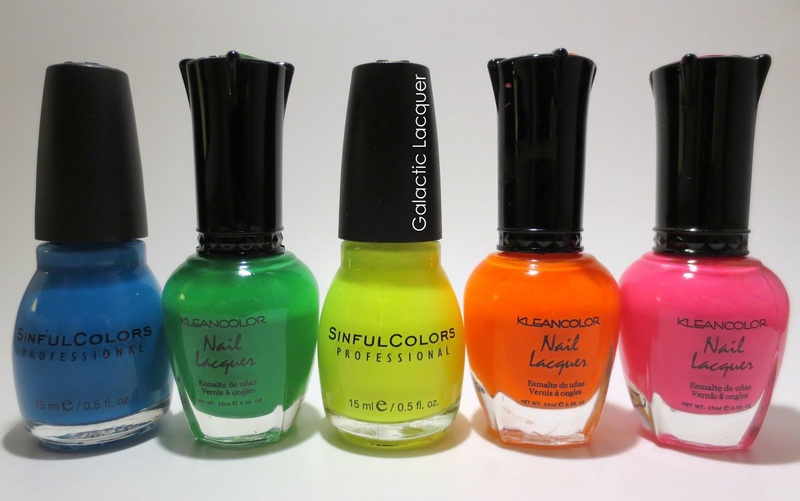 The colors I used: Sinful Colors - Why Not, KleanColor - Neon Green, Sinful Colors - Neon Melon, KleanColor - Neon Orange, KleanColor - Neon Pink. I know, the KleanColor names aren't all too creative, are they? 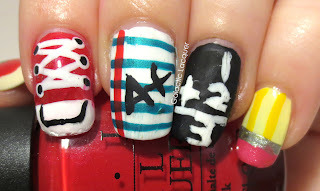 Despite my day being entirely too hectic to do anything too intricate and fun, I still really like these nails! I haven't used my neons in a long time, and they're so bright and cheery, it's a great way to end this day. Skittles manicures have been growing on me too, and this one certainly helped my love for them grow! My new camera arrived yesterday, so I played around with it long enough to figure it out for today's post. I'm super excited with how my photos are turning out with it already! To put it to the test, I used a polish that my old camera would have a difficult time focusing on - something with lots of tiny glitter. I'm new to Kunimitsu Nail Potions, but I bought quite a few to try out. 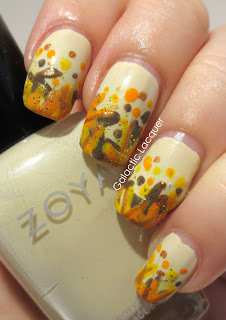 They are all so gorgeous, but I thought this one in particular was perfect for fall time and Halloween coming up! Although it's black and orange, it is called Calico, like a calico cat. I can take awesome bottle shots now too! Calico is a clear base filled with lots of tiny glitter. It has small black hexes along with metallic orange hexes, and it has some even finer white glitter too. 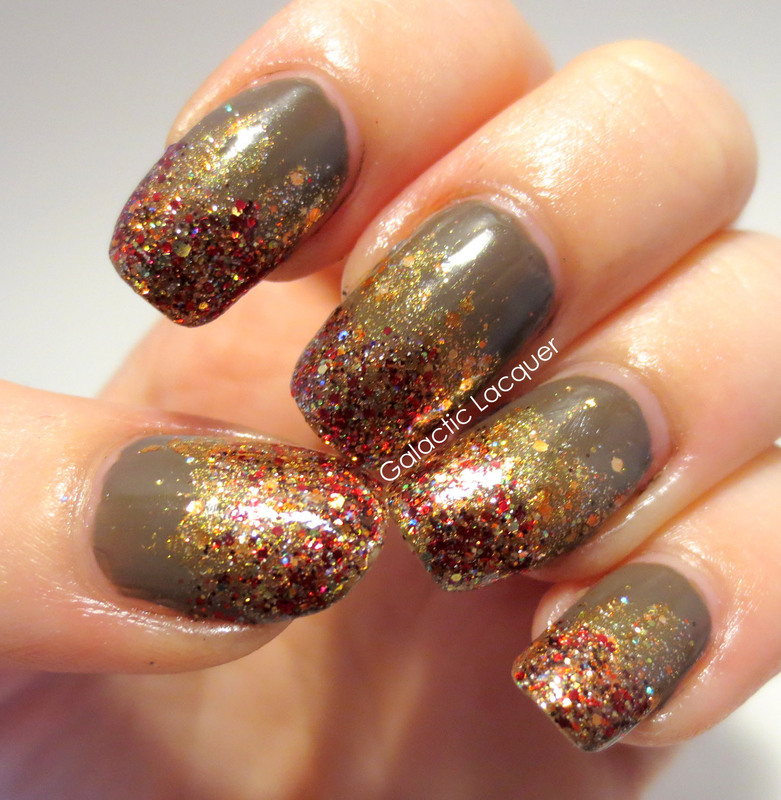 I'm always really drawn to polishes with lots of super fine glitter! I applied two coats of Calico on top of two coats of Essie's Chinchilly. I wanted to pick a neutral base color so I could appreciate Calico itself, but also see the black and white. This warm gray tone seemed perfect! Since it's made up of very tiny glitter, it's easy to smooth out. I applied a coat of Seche Vite on top, and it's almost perfectly smooth. I'm very happy with this polish, and I'm so happy that I got more from Kunimitu Nail Potions to try too! You can check out Kunimitsu on Etsy and snag some of her polishes at a reasonable $8 each. 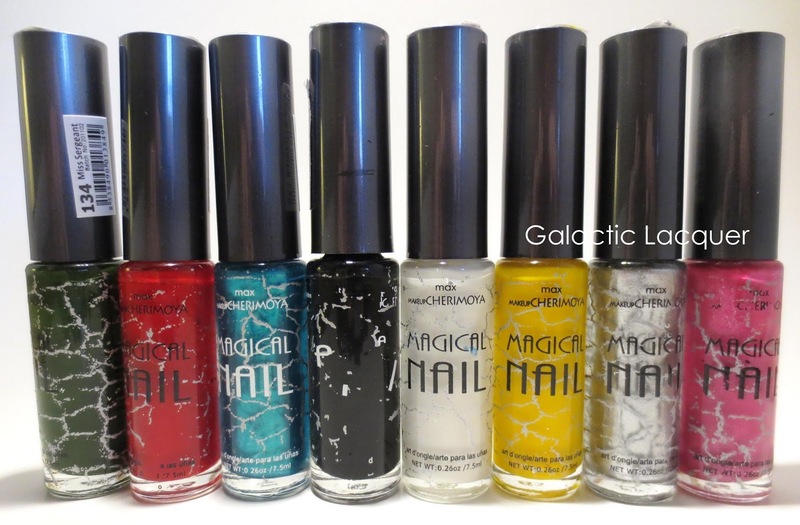 Also follow Nail Potions on Facebook to get updated too! 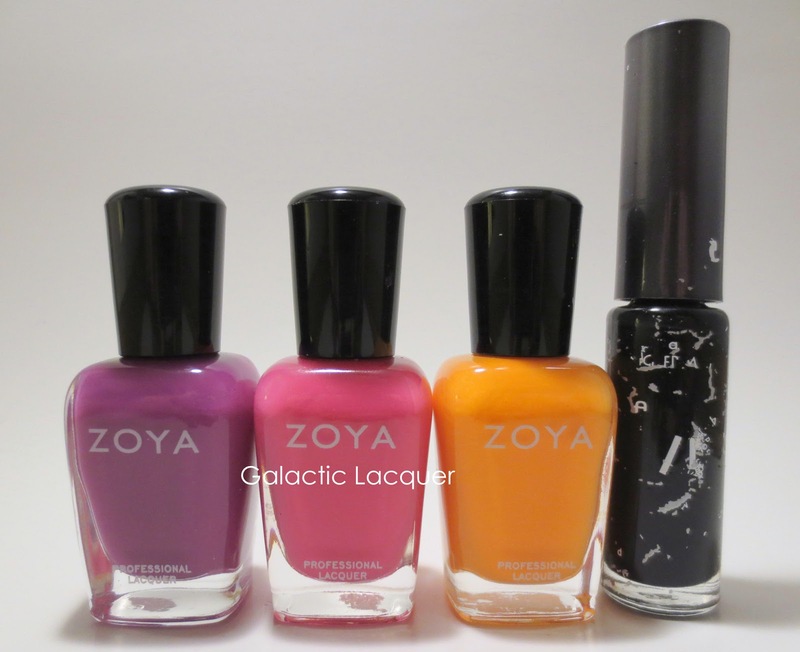 I've been going through a lot of my polishes recently, trying to put some aside to give away, swap, sell, donate, etc. In the process, I've been finding a lot of polishes I haven't even used, or have barely used! I also found that I have a lot of similar shades, so I thought of attempting my first ombre manicure. It's subtle, I suppose, since I chose shades that were very similar. I probably should have gone even darker towards the pinkie nail, but I'm still pretty happy with my first try at it! I didn't mix any polishes together to achieve this look, although I may try that next time to get it to flow from nail to nail better. Mixing your own colors for an ombre might work better, or also choosing some colors that are a little more different than each other. Mixing might be the better option since they will probably also be more consistent in terms of their appearance. Lined up in the bottles, they looked great! But on my nails, some are jellies and some are cremes, so they have different depths to them and appear slightly different than in the bottle. Still, I'm actually pretty happy with it. I like the way it flows, and it has the fun ombre effect without there being too much contrast. Next time I may mix a couple cremes together to make five different shades, but for my first attempt, I like it! I got an interesting little packet a while back from a meetup with the Beauty Bloggers of Central Florida. I got lots of products to test out and review, on top of having a great time with other bloggers. I've been reviewing the products on and off since, and had some fun with this little packet of various wipes. My camera didn't really like the clear plastic pouch that they came in, but I did. I think it's a really neat little way to sell these individual sachets. The pack comes with 8 sachets, all 100% biodegradable wet wipes with natural ingredients. They're also cruelty free. Since they also help save on water, they'd be perfect for traveling light or for camping. Among the eight different sachets, there were two oil-free facial cleanser wipes, a nail polish remover pad, a body soothing wipe, a waterproof makeup remover wipe, and three hand sanitizing wipes. I think this is a great variety of products since it covers just about everything! Oil-Free Face Cleanser Wipe, Fragrance-Free - The wipe inside is quite large - it measured just over 6x7 inches, so it was definitely big enough to get the job done. I used it in place of washing my face to see how well it would work, and it did surprisingly well. My face didn't feel oily afterward, and no rinsing is required with these wipes. This one also didn't have a scent, so it was sort of like cleaning my face with a damp washcloth - cool and refreshing, but not too exciting. Oil-Free Face Cleanser Wipe, Naturally Fragranced - This one was just like the above, except this one was slightly scented. It had a pretty generic fresh scent to it, but it made it a little more enticing than the fragrance-free one. Still, my face didn't feel oily, and felt clean without needing to be rinsed. Acetone-Free Nail Polish Remover Pad - Being acetone-free, I was a little skeptical. I use some other acetone-free nail polish remover pads, but they require a bit of elbow grease. Or they're so thin that they don't hold a lot of remover, and hence I use about three of them for all 10 nails. This one worked well, and had a fresh tuscan orange scent to it, but the almost 2x3" pad was disintegrating by the time I was done with all 10 nails. I honestly put it to the test by trying to remove the bulk of my jelly sandwich nails, so I'm surprised it held up as well as it did. It didn't remove all of the glitter, and didn't get all 10 nails because it was glittery, but it still worked pretty well. If you were removing a "normal" polish, like a creme or shimmer, it would probably do all 10 with no problem. Waterproof Makeup Remover Wipe - This one didn't have much of a scent to it either, but perhaps that's good since it's meant for removing tough waterproof makeup around your eyes. I prefer a bit more of a fresh scent, but these ones don't have too many add-ins since they're natural ingredients. Still, it worked very well, and removed my eyeliner, waterproof mascara, concealer, and everything in a few wipes. It was very easy, and the 5x4" size was large enough to get everything. Instant Body Soother Wipe - I was a little intrigued by this one, wondering what I would use it for to test it. I suppose the idea is to have this while you're our hiking, camping, or traveling, and need to massage it onto your neck, shoulders, or "wherever you may feel fatigued or tense," as the packet said. I haven't gone hiking in a while, so I went out for a run and then used half of it (I cut it in half with scissors). Being a bit sweaty, I didn't feel too much, other than the nice coolness of the wipe, with the light but invigorating scent that was almost minty. After showering, I used the other half, and it helped my body cool down a bit, but I think it was the nice scent that was also therapeutic. Healthy Hand Sanitizer Wipes (x3) - This is the only one in the packet that had more than one wipe to try. They are alcohol-free, which is interesting, since most hand sanitizers are alcohol based. Since they don't just smell like alcohol, they smell very nice and fresh from the start. They left my hands feeling very clean and soft without over-drying my skin like some alcohol based sanitizers do. I suppose these aren't for everyday use, but if you're really into the natural ingredients and the fact that they're cruelty free, then I'm sure you could work them into your daily routine. Personally, I prefer to wash my face with facial cleanser and water, and use Bath & Body Works hand sanitizers. Still, I enjoy these products, especially the makeup remover wipes, and would definitely consider them for traveling if not everyday! If you would like to purchase some, you can check out the La Fresh Group website. Currently, these travel packs are $4.99 each, but are also on sale: buy one, get one 50% off. You can also purchase multipacks of just one or two kinds if you're not interested in all of them. This product was provided by La Fresh for review. As always, I only offer my honest opinion. 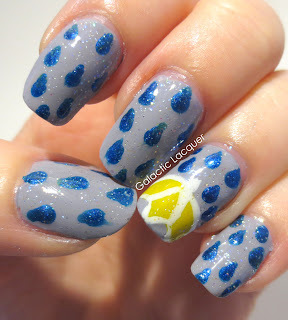 Okay, I'll admit that today's nails are a bit boring after having the exciting Pacman nails on for a while. I try to post on Tuesdays and Fridays with my current schedule, so although I wasn't really ready to take off Pacman and the ghosts, I wanted to put up something new. It's also my 5 year anniversary with my boyfriend, so I thought I should put something nicer on! This polish by Revlon is called Smoldering. It's mostly silver, but shines different colors in the light. It mostly has a pinkish sheen to it, but it also appears orange and green off to the sides of the bottle. Almost like a duo or multichrome, but nowhere near as intense as true duochromes. It looks a bit dull on my nails. Well, it's certainly glossy and shiny since I applied a coat of Seche Vite on top, but I mean it's a bit boring. In person, it's mostly silver with a pinkish shimmer to it. It's very noticeable to me, but the camera unfortunately didn't pick it up very well. I applied three coats of it, as it was somewhat thin. I tend to have this problem with a lot of Revlon polishes. The formula seems a bit watery to me, but at least they go on smoothly, and two or three coats seems to do the trick for most of their polishes. This one was pretty sheer, so three made it opaque. The camera doesn't seem to catch the direct pink shine, but only seems to get it where the light is reflected onto the nails, as you can see on the middle finger nail. It's honestly very shimmery pink in person, but alas, my little Kodak can't show it. Hopefully I won't have this problem anymore since I've ordered a nice new Canon! 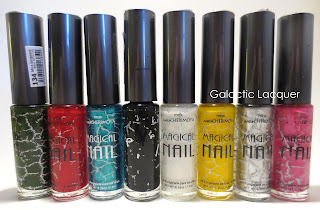 If it can handle macros better than this, I'll be happy, and I'll certainly be putting it to the test with the most glittery, gritty polishes I have!